Partly cloudy this evening, then becoming cloudy after midnight. Low 67F. Winds SE at 5 to 10 mph.. Partly cloudy this evening, then becoming cloudy after midnight. Low 67F. Winds SE at 5 to 10 mph. The Municipal Development District and Baytown council are considering another change order to the Brunson Theater project, which will increase funding by $126,008. City Manager Rick Davis said the change orders are not dollars spent, but instead are dollars authorized. the renovation project to $1,385,890.40. The third amendment to the agreement between the city and MDD, if approved, would bring the total MDD funding obligation to $1,511,899.21. It adds waterproofing and sealing to the theater’s floors and walls, adds flashing to adjacent buildings to prevent flooding, and adds 136 calendar days to the construction contract. Davis emphasized this does not necessarily mean the project will take 136 extra days, but might push it out a couple of months. Davis said workers have sealed the floor and added some more roof support to the theater, but not sealed the floors. Davis said the proposal is to place sheathing up at the top of the roof and come down the sides a bit to seal the top of the roof. Davis said the sheathing costs range from $20,000 to $30,000. The largest part of the cost is pulling the drywall off and applying the proxy everywhere, which is about $125,000 of “authorized” funds, according to Davis. The colored terrazzo flooring is another area Davis said they plan to focus. Davis said the floor has areas where it has crumbled over time, and cement patches have been added. Davis said this will cost about $30,000. However, he was quick to add the project is not over budget. Davis emphasized the three-prong mission the city has with the Brunson. The MDD meets at 4:30 p.m. at City Hall, 2401 Market St., in the City Council Chamber today. Council will then meet at 6:30 p.m. in the same location tonight. 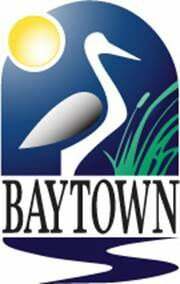 Agenda items and a video posting of the meeting, which will be available sometime after the meeting, can be viewed by logging on to www.baytown.org/city-hall/city-council/agendas-minutes.